This Saturday (1st December) and late night Thursday (6th) Sue Paraskeva's porcelain workshop will be open to the public as she, and four guest artists showcase a wonderful selection of porcelain, contemporary artwork, glass brooches, abstract prints and handmade organic skincare. Head to Sue Paraskeva’s Ryde workshop this weekend (20-23 July) where four artists will be showcasing a selection of porcelain, contemporary textiles, jewellery and abstract paintings. The August bank holiday weekend brings with it a chance to meet seven of the most talented and highly-accomplished artists on the Isle of Wight, in the wonderful depths of beautiful St Lawrence. 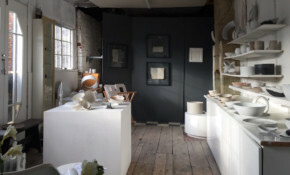 Head to Sue Paraskeva’s workshop and creative space over the weekend of 20-23 July where she and three other artists will be showcasing a selection of porcelain, contemporary textiles, jewellery and abstract paintings. Highly acclaimed Isle of Wight potter, Sue Paraskeva, has recently collaborated with Sebastian Cox for a show in Miami. See her work and read the Crafts Council interview. The eight fully-established, award-winning artists based at Binnel Studios in St Lawrence invite you to their third summer exhibition between 26-28 August 2017. Highly recommended if you appreciate world-class quality. The launch event of the 2017 Ryde Arts Festival features the private view of an exhibition, a performance from dancer, Sophie Wintersgill, alongside live music from a string quartet, as well as the re-creation of the ‘Smashing Performance’ shown at the Saatchi Gallery by Sue Pareskeva. The new season of events at Quay Arts in Newport is fantastic and offers something for everyone, whatever your taste in music, art, film and comedy. The six fully-established, award-winning artists, based at Binnel Studios in St Lawrence, invite you to their second summer exhibition between 6-8 August. Highly recommended if you appreciate world-class quality. The 2016 Ryde Arts Festival (23rd June to 3rd July) promises ten days of wonderful art, live music, poetry, comedy, puppetry and much, much more. Make sure you check out what's on with our handy guide. We reckon it's a great choice and look forward to exciting times ahead. It's great to see Isle of Wight potter, Sue Paraskeva, featured in the Wall Street Journal today. Keep up the great work.